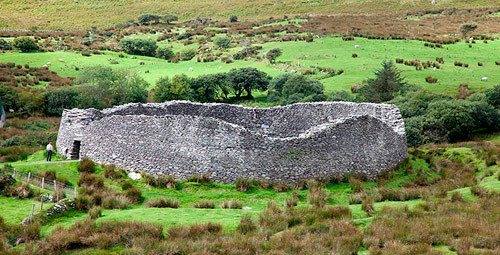 Kerry Gems After 6,000 years, there is a long history of architecture in Kerry. 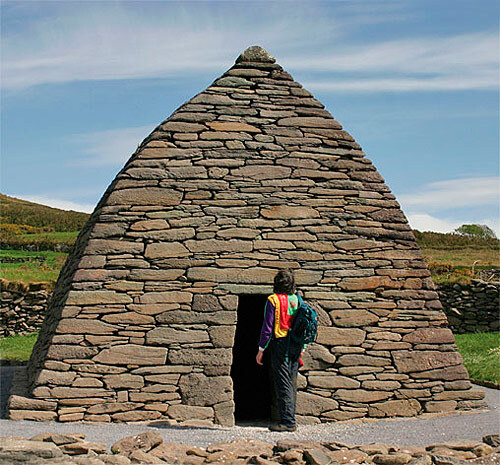 With over 6,000 years of inhabitation, there is a long history of architecture in Kerry. However, few traces remain of the first people to arrive here as the structures would have been mostly of wooden construction. Is not until people begin farming the land that we see many of the stone structures that we can still see to this day. 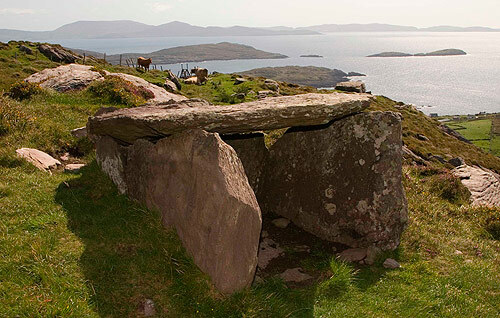 It was during this Neolithic period, dating from c.4000-2000 BC that Ireland’s 1,200 megaliths were built. Some were single standing stones, other were stone alignments, others were stone circles, aligned with the sun, while others were tombs. As well as their spiritual and ceremonial use, they are also a statement of ownership of the land. The Iron Age in Ireland (400 BC-400AD), for some little understood reason, seems to have been a particularly violent time. Many weapons are found from this period and there was a substantial increase in the number of forts built. With the coming of Christianity in the 4th century that we see the beginning of what were to be our most decorative buildings. 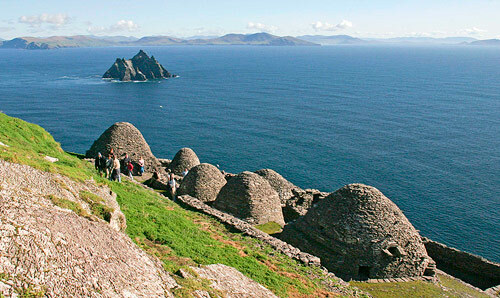 Initially these were basic stone huts such as the beehive huts on the Great Skelligs Island off the Kerry coast. Towards the 8th and 9th century the designs become more ornate, such as the beautifully corbelled church at Gallarus on the Dingle Peninsula. However, it is in the middle of the 11th century that we find our most elegant structures. The introduction of Romanesque architecture inspired the beautiful and highly decorated doorways found in the churches at Inisfallen and Kilmalkedar. 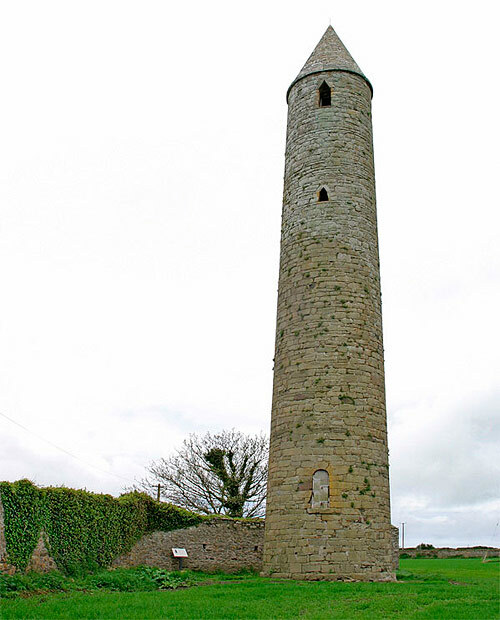 This was also the period in which Round Towers emerged at monastic sites. A fine example can be seen at Rattoo, near Ballyduff in North Kerry. 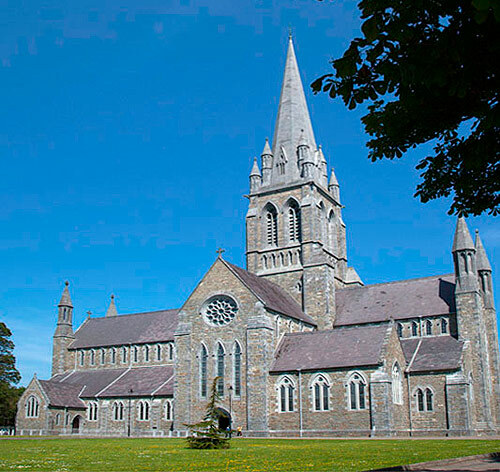 The Romanesque period was short lived as the coming of the Anglo-Normans at the end of the 12th century brought with it the pointed Gothic arches that was to be the feature of the medieval churches throughout Ireland. 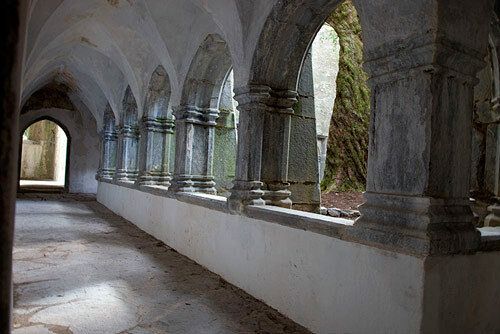 One of the most interesting examples of this transition is to be see at Muckross Abbey (1340 A.D.) in Killarney. It seems as if the builder of the cloister began with the rounded Romanesque arches and then decided to finish the remaining arches in the new Gothic style. The 15th century is also the period when we see the rise of medieval castles. The coming of the Normans followed by Cromwell’s forces in the middle of the 17th century made fortification a necessity rather than a luxury. Following the defeat of the Irish, the country was divided into parcels of land and given as payment to Cromwell´s soldiers. 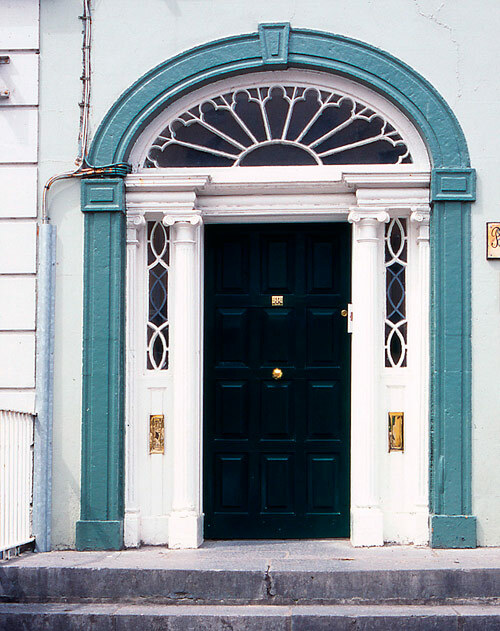 This was the beginning of a new era in Irish history and Irish architecture – the coming of the landlords and the big houses. 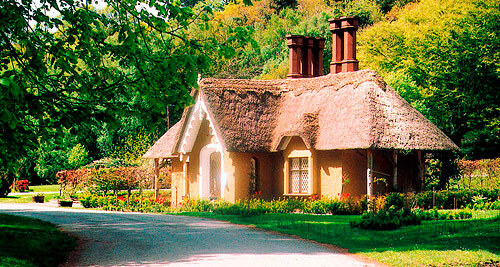 In the 19th century the majority of Ireland’s eight million population lived in poorly constructed thatched cottages. There were some exceptionally fine examples of these cottages to be found on the great landlord estates, such as Deenagh Cottage on the estate of Lord Kenmare in Killarney. Many of the attractive town houses to be found in our cities and bigger town date from the Georgian period (1714-1830). Examples of these houses are to be found in Tralee. 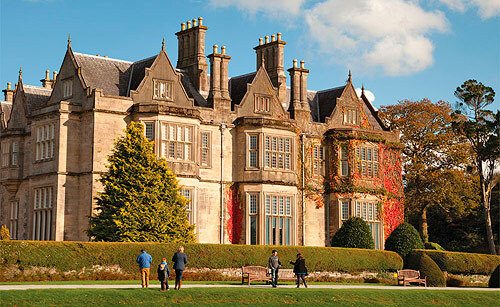 Some other finest architecture in Kerry is credited to English architect, Agustus Pugin (1812-1852). Among the many fine Gothic buildings he has left us are The Palace of Westminister and St. Mary’s Cathedral in Killarney. During your holiday in Kerry why not turn detective and explore Irish architecture? You will find fine examples from every period here – from stone huts to magnificent houses.